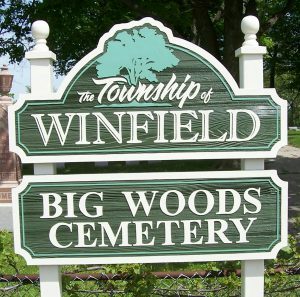 Welcome to Winfield Township located in DuPage County, Illinois. Winfield Township is comprised of most of West Chicago, Winfield, and Warrenville and includes small sections of Wheaton, Naperville, Aurora, and Batavia. 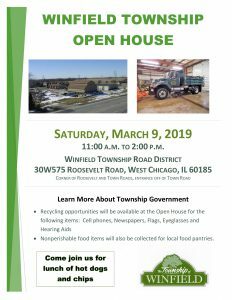 If you have any questions or comments please feel free to email us at info@winfieldtownship.com or the Road District at road@winfieldtownship.com. Learn more about Winfield Township History. Please note that Winfield Township, as well as other government buildings located within the Township, are WARMING CENTERS during regular business hours. We are open Monday through Friday, 8:00 am to 4:30 pm. Please call with any questions (630) 231-3591. General Assistance, Property Tax Assessments and Road Maintenance, as required by statute and policies. For Township Department click here. Click here to get information regarding FOIA. The Board of Trustees meets the second Monday of each month at 7:00 p.m. at the township office, except in November (third Monday). The Annual Town Meeting is held on the second Tuesday in April at the Road District Office: 30W575 Roosevelt Road, West Chicago, IL.